Coincidence? Luck? I received this message at Jewish Christmas Chinese dinner. It was December 25th 2012, Christmas Dinner. Stephen and I went to Shanghai Inn, just like we had the year before. I ordered vegetables and rice, he ordered a dish he didn’t like. We shared egg rolls. Dinner ended and we were handed the customary fortune cookie. 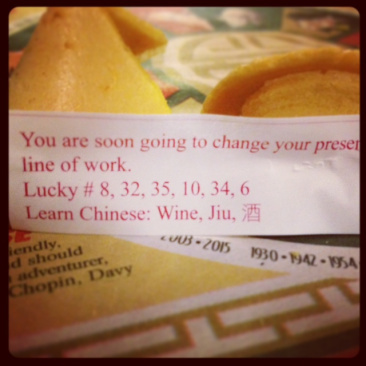 I cracked open my cookie to find a small paper that read “You are soon going to change your present line of work.” I giggled, made a snarky comment, and placed the paper in my wallet. I don’t believe in luck. I dont believe in fate. I do believe we can’t control everything. We do have control over our choices. We have control over how we treat our bodies, the work we choose to do, the relationships we choose to participate in, and how we want to shape the world. On December 28th 2012 I took control of the work “I do” and decided I was no longer going to work a job that did not fulfill me. I have decided to reclaim my power by starting my own company. My company fuels my passion to empower women (specifically girls) to challenge the systems of oppression in our country and take ownership of their lives. I have an amazing business partner and I don’t think this is luck. We have already experienced success and I don’t think this is luck. It is our purpose to create something great. We have ownership of our future, luck does not.